Luxury in Motion is a premium, chauffeur-driven wedding car hire service. We provide professional chauffeurs on your wedding day and have a wide range of modern and vintage luxury vehicles available for wedding car hire. We primarily serve Surrey, London and the following counties: Berkshire, Hampshire, Sussex and Buckinghamshire. Our fleet includes prestige car marques such as the Bentley Mulsanne and Rolls-Royce Phantom. 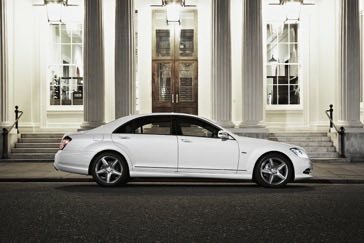 If you have a more bespoke request, we can also source vehicles of a more unique nature. To reflect the nature of the wedding market, we offer discounts for wedding car hire on weekdays, or during the winter months and can also organise transport home for your evening wedding guests, or airport transfers for your honeymoon.